MAZAR-I-SHARIF, Afghanistan — The Taliban carried out the biggest known capture of Afghan soldiers of the war, taking 150 prisoners after they chased units into neighboring Turkmenistan and that country forced them back, Afghan officials said on Sunday. The operation took place in the northwestern Afghan province of Badghis, and brought to 190 the number of soldiers captured by insurgents in the hotly contested district of Bala Murghab — with 16 more soldiers killed — in less than a week. Last Monday, an entire Afghan Army company was killed or captured there. By Saturday, its defenders said the district had fallen mostly into Taliban control, though Afghan forces were still holding the district’s government center. The episode consisted of two days of attacks by the Taliban in the Morichaq area of Bala Murghab against two units of the Afghan Border Forces. Early Saturday, 50 soldiers from the force surrendered, and an additional 100 fled Taliban pursuit and crossed the nearby border into Turkmenistan, according to Saleh Mohammad Mubarez, commander of the Afghan police in the district. By the end of the day, he said on Sunday, Turkmenistan had forced them back into Taliban hands. Lt. Habibullah, a deputy company commander in Badghis who uses only one name, also confirmed the surrenders. “Turkmenistan told the Taliban, ‘We will give the border force soldiers’ weapons to the Afghanistan government and give you the border force soldiers, but the Taliban said that you should give the troops to the Afghan government and give us their weapons,’ ” Lieutenant Habibullah said. On Saturday, some Afghan officials played down the capture, saying the soldiers who had crossed into Turkmenistan would be returned to the government side. Jamshid Shahabi, a spokesman for the Badghis provincial governor, said the escape toward Turkmenistan by the 100 soldiers had been part of a previously arranged security plan. A spokesman for the Ministry of Defense, Qais Mangal, said that those who had surrendered were not regular soldiers, but irregular militia fighters. But numerous local officials said they were indeed regular soldiers with the border forces, which are part of the Afghan Army. On Sunday, Mr. Mangal said he did not immediately have any further details on the border episode. There was no public comment by the authorities in Turkmenistan. The Afghan authorities did send reinforcements to Bala Murghab District, which has been under heavy attack for two weeks, but local officials said that they had been insufficient. Farid Akhezi, a member of the provincial council in Badghis, also confirmed the surrender of 150 border force soldiers on Saturday. The Taliban wiped out an entire Afghan National Army company in the same district on Monday, killing 16 soldiers and taking 40 prisoners. 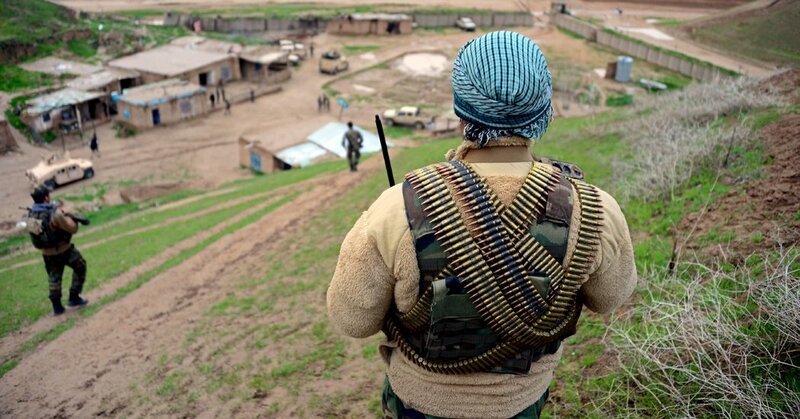 Over the course of the week, 44 Afghan security force members were confirmed killed in Taliban assaults in Badghis, in addition to the 190 reported to be taken prisoner. The Taliban said that they had taken the Morichaq area and captured all the Afghan forces there, but the insurgents actually had lower estimates of the number of prisoners than government officials had given. A spokesman for the Taliban, Zabihullah Mujahid, said on his Twitter account that they had captured 72 soldiers and police officers in the fighting in Bala Murghab and killed many others. He also posted photographs showing what he said were prisoners; more than 60 are visible in them, although it was not possible to confirm the authenticity of the pictures. Taliban treatment of government prisoners varies widely around the country. In some cases they are imprisoned, in others tortured and executed. More often, however, they are released after promising not to rejoin the fight. In an unrelated attack elsewhere in northwestern Afghanistan, the Taliban overran an Afghan National Army base in the district of Qaisar in Faryab Province, killing 15 soldiers and five police officers in hours of fighting on Saturday night and Sunday morning, according to the governor of the district, Rahmatullah Qaisari. “This morning when our forces went to recover the corpses, the Taliban had hidden bombs under the bodies, which went off and killed two policemen,” he said. That took the death toll there to 22.